Former U.S. first lady Laura Bush lays bare her own pain and defends her husband in a new book that will be published next week. For the first time, Bush is going public about a car crash in Midland, Texas, that claimed the life of a high school friend when she was 17, the New York Times is reporting. The 464-page book, published by Simon & Shuster, is due on store shelves May 4. The New York Times says it obtained a copy at a bookstore. 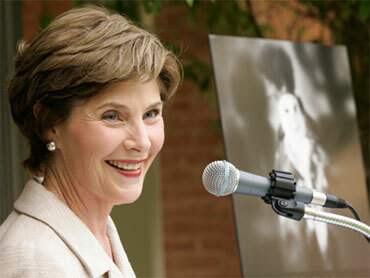 In it, Bush bristles at criticism thrown at her husband, former President George W. Bush. She says his New Orleans flyover after Hurricane Katrina was in the best interest of victims and aid workers. Mr. Bush is writing his own memoir, tentatively called "Decision Points." It is scheduled for a 2010 release by Crown, an imprint of the Crown Publishing Group. A former librarian, Mrs. Bush made literacy a favorite cause during her years in the White House. She has co-authored a number of books for children, including one with her daughter, Jenna Bush Hager. Although Bush has never spoken about the accident, it was featured prominently in Curtis Sittenfeld's bestseller novel "American Wife," which reportedly is based on much of Laura Bush's life.